Bloodaxe’s editorial, publicity and rights office is now at South Park, Hexham, Northumberland. Sales are still handled in Bala, but distribution is now with Grantham Book Services (GBS), while book trade marketing is done by PGUK. Bloodaxe Books is named after Erik Bloodaxe, the last Viking king of independent Northumbria, who features in Briggflatts as Basil Bunting's opposite persona to the Cuthbert side of his Northumbrian identity. These lands were ruled in the 10th century by Erik, a murderous chieftain who had to flee from Norway, becoming king of Orkney, Dublin and twice king of York and Northumbria. After his death in 954, the North became part of England for the first time. Erik was perhaps our first patron of poetry: when saga hero Egil was captured on his territory, he made him write a praise-poem overnight on pain of death. The poem, while totally disingenuous, is a brilliant example of the drápa form, and Erik was so delighted to be immortalised by the great bard Egil that he spared his life. Bloodaxe's Hexham office is part of the rural enterprise hub established by Northumberland National Park at their headquarters at Eastburn, South Park. We're on the first floor of the south wing (on the right in this picture). 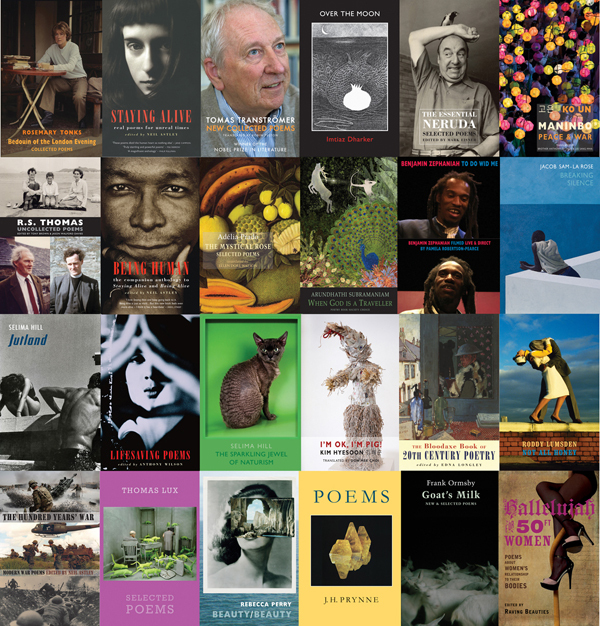 Bloodaxe's sales office has been housed with sister company Pandon Press since 1997 in Penllyn Workshops, a rural enterprise business centre in the town of Bala in North Wales. 2000-2014: Highgreen, Tarset, Northumberland. Bloodaxe was the first occupant of an office newly converted from a stable block and one-time granary behind Highgreen Manor which also hosts VARC’s rural artist residencies. Basil Bunting lived in a cottage a few miles down the Tarset valley in 1981-84. Bloodaxe stayed at Highgreen for 14 years, but bad winters were a problem: staff often couldn’t get to work, and when trucks did manage to get through with deliveries of books, they’d get stuck in the snow. 1998-2000: The Old Signal Box, Falstone, Northumberland. The office here was in a converted railway signal box (pictured here in 1956!) owned by the Forestry Commission, who used the station building itself as a cold store for culled deer. We overlooked a disused station platform where rangers would deposit rows of carcasses brought down from nearby Kielder Forest. 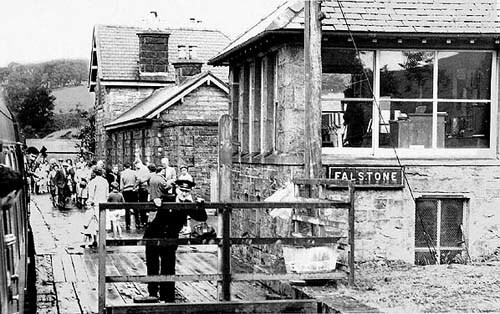 The Falstone sojourn ended when a change in the Forestry Commission’s deer culling arrangements meant the Old Signal Box was surplus to requirements and had to be sold. 1997-1998: Dargues Hope, near Otterburn, Northumberland. Bloodaxe's most remote Northumberland office was in a large farm house (seen here middle left) situated two miles up a rough track, with three gates to negotiate, one sometimes guarded by a bull. Delivery drivers made frequent complaints about the difficulties of access. 1997: Elrington Farm Cottages, near Hexham, Northumberland. The first Northumberland office was just one room in a farm cottage, with a store room retained in Hawthorn House in Newcastle (enabling Bloodaxe to keep its Newcastle PO Box publishing address). 1991-1997: Hawthorn House, Forth Banks, Newcastle. This building has now been gutted and absorbed into the city’s new Stephenson Quarter development. It’s part of the site of Robert Stephenson’s Forth Street locomotive works where the revolutionary Rocket was built in 1829. Our space was sublet from a company which trained HGV drivers and security guards. When this firm went bust overnight – and its staff and trainees were seen making off with computers and furniture in lieu of pay – Bloodaxe became the sole occupant of an otherwise deserted office complex, paying no rent for the next year while waiting for someone else to lay claim to the building. 1984-1991: Exchange Buildings, Newcastle. 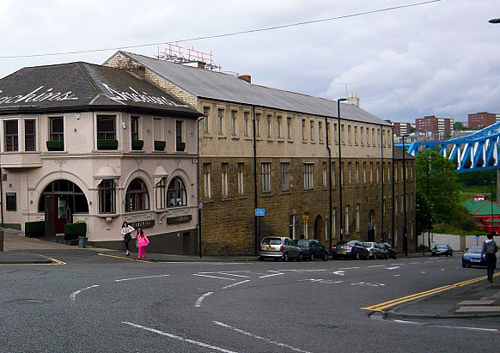 In 1984, after being run for the first seven years from various flats around Newcastle, Bloodaxe was able to move into its first office, in the old Exchange Buildings on Newcastle Quayside, then a run-down home for old shipping companies and new arts and community enterprises, while a trade distributor in London took over the warehousing and despatching of books. 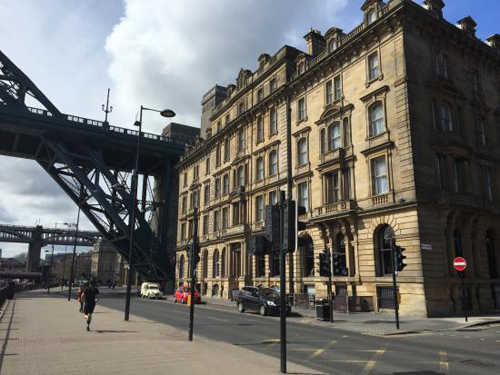 All the tenants were forced to leave when the building was taken over in the redevelopment of the Quayside (it’s now an upmarket hotel and restaurant complex).